JUDAH P. BENJAMIN. Pamphlet, “Speech of Hon. 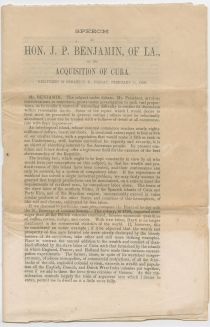 J.P. Benjamin of Louisiana, on the Acquisition of Cuba. Delivered in Senate U.S. Friday February 11, 1859.” Includes original envelope, 7¼ x 3¾ in., free franked in the upper right by N.J. Senator John Thomson (1800-1862). 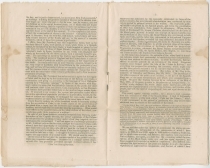 16 pp., 6 x 9½ in. “1. The actual increase of the slaves already there. “2. The introduction of persons bound to service under the name of apprentices, or coolies, or colonists. The idea of annexing Cuba to the United States had an already long history, with Southerners particularly interested in acquiring the island to add another slave state to the Union. 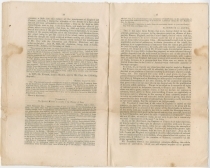 President James K. Polk insisted that annexation must be by “amicable purchase” and had his Secretary of State James Buchanan prepare an offer of $100 million, which Spanish officials rejected. 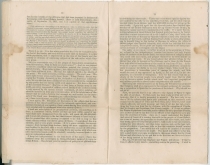 President Franklin Pierce was committed to annexing Cuba, and in 1854, his ministers to Great Britain (James Buchanan), Spain, and France, met in Ostend, Belgium, to draft a dispatch arguing that purchasing Cuba would benefit each of those nations. But the “Ostend Manifesto” also declared that the America would be “justified in wresting” the island from Spain if it refused to sell. 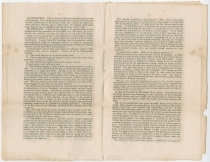 When the Ostend Manifesto reached Congress in October 1854, many Europeans denounced the circular, and it became a rallying cry for anti-slavery Northerners. Pierce’s successor as President in 1857, James Buchanan, was also committed to Cuban annexation, but popular opposition and the growing sectional conflict hampered his efforts. Considering it “highly important if not indispensable,” Buchanan sought support for the acquisition of Cuba. 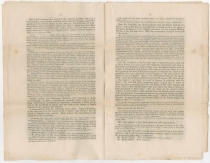 On January 10, 1859, Senator John Slidell (1793-1871) of Louisiana introduced a bill (S. 497) making an appropriation of $30 million to facilitate the acquisition by negotiation. On January 24, the Senate Committee on Foreign Relations reported favorably. On at least three occasions, Senator Benjamin spoke in favor of Cuban annexation—on February 9, in this speech on February 11, and again on February 15. 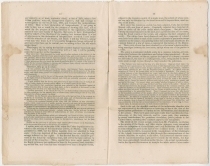 The new anti-slavery Republican senators found it difficult to oppose the annexation due to public support for expansion, but managed to launch a filibuster, and S. 497 never came to a vote. Spain maintained its claim to Cuba until 1898, at the end of the Spanish-American War. 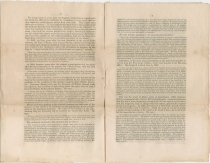 However, Congress decided against annexation, and Cuba gained formal independence in 1902. Judah P. Benjamin (1811-1884) was born in the Danish West Indies (now U.S. Virgin Islands) to Sephardic Jewish parents who had emigrated from London. In 1813, the family moved to North Carolina, and in 1821, to South Carolina. Benjamin entered Yale College at age 14, but left abruptly two years later. In the late 1820s, he moved to New Orleans, where he opened a successful law practice. Benjamin served in the Louisiana Senate (1852-1853) and U.S. Senate (1853-1861) before joining Jefferson Davis’s cabinet first as Attorney General, then as Secretary of War, and finally as Secretary of State. He was known as “the brains of the Confederacy.” A New Orleans lawyer, Benjamin held the post of attorney general, until Davis decided he needed him in a more important role. In September 1861, Benjamin became Secretary of War. His closeness to Davis—and his Jewish faith—attracted resentment from jealous rivals. With the loss of Roanoke Island in 1862, along with Grant’s capture of Forts Henry and Donelson, critics demanded Benjamin’s resignation. Davis responded by promoting him to Secretary of State, a post he held until the collapse of the Confederacy. Initially part of Davis’ contingent when the Confederate president fled Richmond, Benjamin continued to Florida and escaped to England, where he thrived as a lawyer and was named to the Queen’s council. He retired in 1883. A split on the last sheet has been expertly mended. Unevenly cut and folded. Very Good. Cuba had a similar population (free and enslaved) to Georgia and would have been entitled to two senators and nine representatives in Congress. United States, Senate, 35th Cong. 2d sess., Rep. Com. No. 351.